Yarns about Yarn Pirates, knitting, cats (required for proper knitting), families (also required for proper knitting), and other eclectic subjects. Ravelry Discussions - my stash comes from the Woolie Ewe! Another finished object. 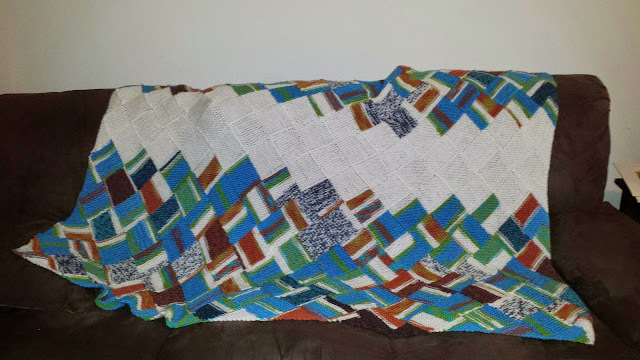 This one is an afghan, approx 70"x65", made with Red Heart Peruvian Print and Red Heart Soft White, size US 7 circular needles, using a garter stitch entrelac technique. I've always loved how random and eclectic the Peruvian Print yarn is. The background for this blog is a scanned image of a cabled sweater I hand-knitted from a pattern found in "Knitting the New Classics," by Kristin Nicholas.